On April 3, 2018, at 2:00 pm, Deputies with the Montgomery County Sheriff’s Office were dispatched to the 29500 block of Tanglewood Road, Magnolia, Texas in reference to an attempted aggravated robbery. When Deputies arrived they met with a 22 year old female Pizza Hut delivery driver who advised Deputies she was shot at having just left a “prank” delivery call. The Pizza Hut delivery employee advised Pizza Hut received a delivery call to an address in the 29500 block of Tanglewood Road. The Pizza Hut delivery employee stated that when she arrived she approached the residence and rang the doorbell, at which time the owner answered the front door by remote from another location and stated he did not order pizza and for her to get off his property. Pizza Hut delivery employee left the location and drove onto Highland Blvd where she observed a dark colored Chevrolet Tahoe driving toward her and then blocked the entire roadway. The Pizza Hut delivery employee stated she observed two individuals exit the Tahoe and walk towards her. The Pizza Hut delivery employee stated she noticed that one individual had a handgun in his hand. The Pizza Hut delivery employee placed her vehicle in reverse and as she backed up she heard one gunshot. The Pizza Hut delivery employee drove back down Tanglewood where she parked at another residence, hid under a residence and called 911. The Pizza Hut delivery employee had a dash mounted camera in her vehicle which captured the incident. 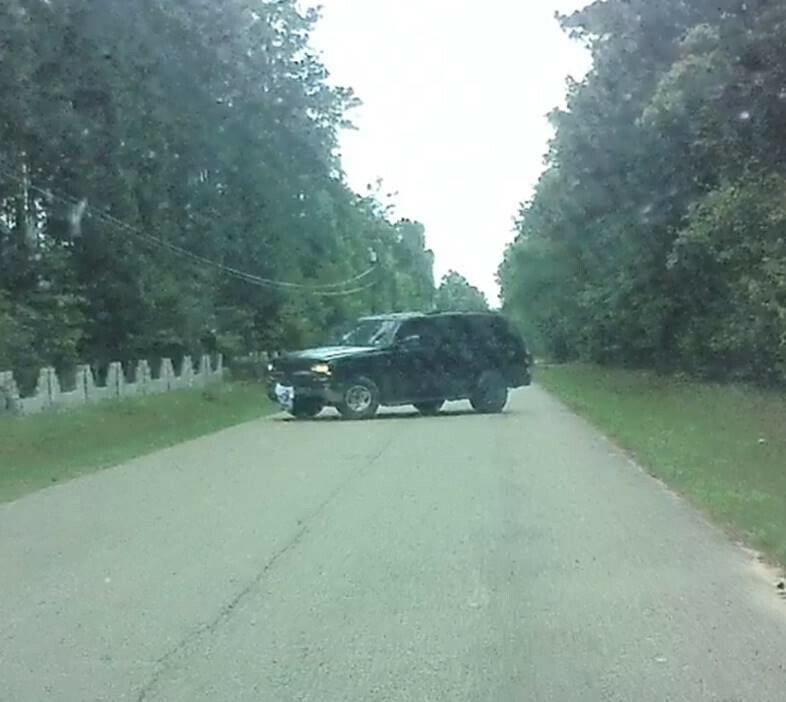 Below is a picture of the suspect Chevrolet Tahoe. Deputies recovered a shell casing from the scene. The Tahoe contained at least 3 occupants, two of the occupants exited from the passenger side wearing masks. From the video, the Tahoe’s license plate appeared to be covered with a piece of clothing. Anyone with information regarding these suspects or this crime is asked to contact the Montgomery County Sheriff’s Office 936-760-5800 or Crime Stoppers at 1-800-392-STOP (7867) and refer to case number# 18A090687.